In California, all students in second grade through eleventh grade participate in the state’s Standardized Testing and Reporting (STAR) Program, which is comprised of a battery of standardized tests. The test taken by the majority of students is the California Standards Tests (CST). The CA STAR tests are a measure of how well students achieve the educational standards taught in California schools. In 2nd grade through 11th grade, the CST covers English-language arts. In 2nd grade through 7th grade, the test also covers math. Additional tests are added at various grade levels. The CST adds a history-social science test for 8th grade, 10th grade and 11th grade. The CST adds a science test for 5th grade, 8th grade, and 10th grade. The CST also adds a math and science test for students in 9th, 10th, and 11th grade. The test they take depends on which math and science course they are enrolled in that school year, such as algebra, geometry, physics, or chemistry. The STAR program used to include the California Achievement Test, Sixth Edition Survey (CAT/6), but this test was eliminated in the 2008-2009 school year. Based on STAR tests and the California High School Exit Examination (CAHSEE), California assigns an Academic Performance Index (API) rating and growth target to each school and district. Ratings range from 200 to 1000, with a goal of 800 API for all schools statewide. For more information, you can visit California Department of Education Testing and Accountability. 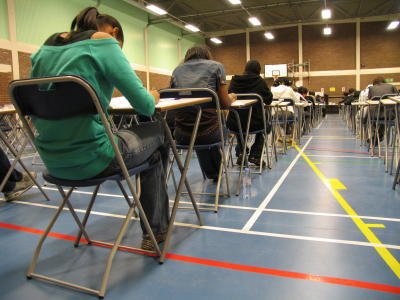 In California, high school students must also take and pass the California High School Exit Examination (CAHSEE) to graduate. As a standards-based test, the CAHSEE determines whether students have mastered key skills in English language arts and mathematics, as defined by the state. The CAHSEE, a pass/fail, untimed test, is administered to all students in 10th grade so that those who don’t pass have time to get help and retake the test before graduation. The CAHSEE tests students on math and English language arts. The math section tests academic content standards for 6th grade, 7th grade and algebra I. The English language arts section tests for content standards learned through 10th grade, including vocabulary, reading, and writing strategies and conventions. The test is comprised of multiple-choice questions as well as a written essay on a specific topic. For general tips on test preparation, please visit our standardized test overview page. The real preparation for STAR tests, and all standardized tests that assess a wide range of fundamental skills, is to steadily build and master fundamental skills in math, reading and writing. To help students succeed in school, parents should make a special effort to get involved in their children’s education. You should ensure your children are doing their homework every night and reading and writing on a daily basis. In addition, families can hire tutors or use an online learning program such as Time4Learning to supplement their children’s schoolwork and help to build fundamental skills. To help your children prepare for state standardized tests such as CA STAR tests, you can enroll your children in a test prep program or buy books to help them become familiar with test formats and terminology, to learn test-taking strategies (when to guess, when not to), to become comfortable with time restrictions, and to practice answering different types of questions.